If you're going to take game night "up a notch", then mimicking David Fincher is a good way to do it. 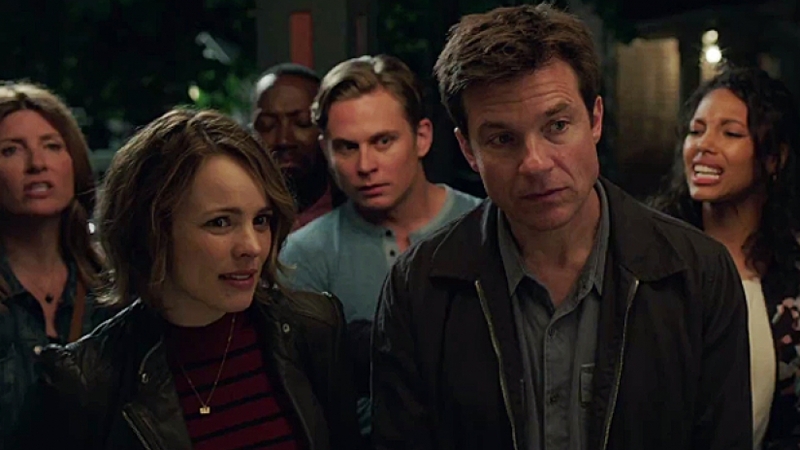 Game Night finds a bunch of boring suburban couples placed in what amounts to a comedic version of Fincher's 1997 thriller, The Game, with references to some of his other films such as Fight Club and Gone Girl sprinkled in like lollipops in a game of CandyLand. Tossing "normal" folks into an evening of life-or-death situations is classic Hollywood comedy at this point, but Game Night adds a fun new wrinkle by having the players clueless to how much danger their actually in. Ever actually had a game night with friends? Like, a regular thing? It can be pretty lousy if the wrong combination of people shows up. Game Night is a lot like that; the players are what keep it so entertaining from start to finish. The ever reliable Jason Bateman and Rachel McAdams are hyper-competitive couple Max and Annie, who meet cute in the way people like them should, over bar trivia. They somehow find romance in their shared love of games, whether it be Charades, Jenga, or Dance Dance Revolution like at their wedding. They keep that spirit of competition high with a weekly game night featuring their closest friends, while ignoring their creepy cop neighbor Gary (Jesse Plemons) who used to be invited. On one particular Gary-less evening, Max and Annie assemble their usual crew: longtime couple Kevin and Michelle (Lamorne Morris and Kylie Bunbury), who are faced with a sudden celebrity hookup scandal; and their dim-witted buddy Ryan (Billy Magnussen) who usually brings women as dopey as him, but this time has found a ringer in whip-smart co-worker Sarah (Sharon Horgan). This night is special because it also signals the return of Max's more successful, more handsome ("He’s like the Mark Wahlberg to Max’s Donnie!") brother Brooks, who promises to kick game night up to the next level. No more Trivial Pursuit, instead he hires a murder mystery group to launch a night-long scavenger hunt with an awesome prize at the end for the winner. There's just one problem: Brooks is actually a pretty bad guy, and he gets actually kidnapped by actual bad guys with actual guns. Not that any of the other players know it. They're blissfully munching on cheese spread while Brooks fights for his life a room away. Co-directors John Francis Daly and Jonathan M. Goldstein have been pretty decent as writers (Spider-Man: Homecoming, Horrible Bosses) and atrocious as directors (Vacation), but they've always found a way to inject playfulness into their films regardless of the overall quality. Fortunately, they click pretty well with screenwriter Mark Perez who puts the gang through a night of super self-aware hijinks and escalating mishaps in which being really good at Pictionary is only marginally useful. What's great about it is that these characters aren't complete idiots...okay, they're pretty stupid, but there's at least some small part of them that recognizes the absurdity of what's going on. I mentioned the numerous references to Fincher movies, but Liam Neeson's name gets brought up, too, as the film pokes fun at the action genre. Turns out "getting the drop" on your enemy is a lot harder than they make it look in the movies. There are even some surprisingly nifty visual cues, like transitions designed to resemble game boards with moving pieces. Also, the women seem to be the brightest bulbs of the bunch while the guys all have serious hang-ups. Max is struggling with feelings of inadequacy compared to his brother, to the point that it may be causing fertility issues with Annie; Ryan's a dope who can't get over his Fight Club fetish; and Kevin won't let Michelle's past infidelity with a Hollywood celeb slide. That last one is a running gag that you think is going to go nowhere, but the payoff is pretty great. Everybody gets their moment to shine, though. Magnussen may have the best pathetic bribe attempt since Chris Elliott in Get A Life, and McAdams is a constant winner as she frolics around unaware that she's carrying a loaded pistol, and nearly pukes when she's called upon to do some emergency surgery. But the best may be Plemons, whose controlled weirdness as Gary is strangely calming for a movie that is necessarily off the rails. Bateman is...well, he's Bateman. We've seen him do this put-on regular guy routine so much that it looks effortless from him, and it probably is. Not bad, just familiar. I like the film better as a chance for others like Morris, Magnussen, and Horgan to show what they can do. Not all of the jokes score, of course, and the film gets too big for its own good in an oversized finale that would be better off in a different movie. There are also one too many twists for a film the audience probably isn't looking to be fooled by at all. Still, Game Night has the charm and definitely the players to be a real winner for those willing to roll the dice.